Happiness is something that is desired by all. But, for some people that happiness becomes very difficult to achieve. No matter how happy they would like to feel, they are, most of the times, overpowered by the emotion of sadness. For some people, sadness may occur without any reason. They are sad for no reason at all. This is because their brain and neural circuitry is developed in such a way that most of the times they are sad. Their brain is developed in such a way right from birth or very nearly from birth. Thus, in a way, it can be said that they are born like this. They are sad, because this is the way they are. The developments of brain imaging techniques in studying the brain have helped a lot in understanding such behaviour. 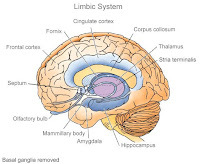 Recent studies have found that sadness is associated with reciprocal increases in activation of limbic areas (brain areas responsible for emotions) and decreases in activation of frontal cortical areas (brain areas responsible for many cognitive and motor abilities). People who are melancholic have been found to have relatively greater levels of brain activity in their right frontal lobe (the front-right side of the brain). They experience negativity and sour moods. They are also easily fazed by the difficulties of life. Research shows that the brains of depressed individuals look different from those who are not depressed. (Depression is not exactly sadness, but sadness is one of the major symptoms of depression. There are many other things related to depression). People with depression seem to have brain abnormalities. Depressed people have a reduced volume in the frontal lobe (front side of the brain), the hippocampus, and the basal ganglia, all of which are brain regions that are involved in mood regulation. Research also shows that people who are depressed have lower levels of brain activity in the left frontal lobe (the front-left side of the brain) and higher on the right frontal lobe (the front-right side of the brain) compared to those who are not depressed. Depression is also caused by a number of hormonal imbalances as well as imbalances in the level of some neurotransmitters (chemicals in the brain that the brain cells use to communicate). Studies indicate that depression is due to a malfunction of the hypothalamus, a part in the brain known to regulate mood. The hypothalamus produces many hormones. A malfunction in the hypothalamus causes an abnormality in the production of those hormones, which leads to a person being depressed. Depressed people often have an abnormally low thyroid hormone levels. They also have enlarged pituitary and adrenal glands. Depressed people also have abnormalities in the neurons of the hypothalamus. Depression is also caused by low levels of the neurotransmitters, known as norepinephrine and serotonin, in the brain. Apart from that, depression is also known to be genetic. People who have a family history of depression have a higher risk to be depressed compared to those individuals who do not. Although some individuals develop these brain abnormalities right from birth or very nearly from birth, it does not necessarily mean that it will remain the same throughout life. A proper upbringing, socialization, and the right kind of environment may lead to changes within the patterns of the brain and make such individuals like any other person. The sub-field of neuroscience known as neuroplasticity suggests that the brain can reorganize itself by forming new neural networks and thus changing the brain structure and neural circuitry in response to new situations and changes in the environment. The new, emerging area of social-neuroscience suggests that proper interactions and healthy and satisfying relationships help in changing the whole brain structure, which leads the person to develop a positive attitude towards life. However, this is not as simple as it may sound. People born with such brain abnormalities are highly vulnerable to stress and are extremely sensitive to even the slightest of disturbing situations. They get easily hurt and perturbed. Due to their high level of sensitivity, they get easily upset and are often misunderstood by others. This also, many a times, makes them unable to enjoy social situations as they would have really liked to do so. All this makes them to struggle really hard to be happy. Because of this, they have to put in a lot of effort to gain happiness. This also leads such people to deal with many other mental health problems. Such people obviously require medication, psychotherapy, and social-skills training. But, this comes at a much later stage. Before that they need a lot of social and emotional support from friends and family. They need to be handled with a lot of patience and care. Nobody in this world wants to be sad. Everybody wants to lead a happy and highly satisfying life. But, for some people this becomes very difficult. Happiness, for them, becomes almost unattainable. This is because some people are just born to be sad. hey,good to get so much informative text here. Thanks for such scientific insight. The mind, is certainly a very intriguing creation! Very informative post! Thanks for the detail! very informative posts you have on your blog! Good to know that you found the post informative. Yeah, the human brain is indeed intriguing, and one of the most mysterious things in the world. Thanks for being a regular visitor of my blog. Oh yes, the brain is really complicated ... abnormalities in even the smallest parts of the brain can have great negative affects our behaviour. That was a good post I've ever read! the realization quite struck me really. but I guess that's just how the mind with emotions works.Its nice to know the other side of medicine, psychology which I sometimes took for granted. it is always a challenge to look at a person in a holistic approach. Abnormalities in the brain can lead to many severe problems. Even the most severe psychological disorder known as schizophrenia is also most of the times caused by some abnormalities in the brain. The brain is indeed very important when it comes to human behaviour. Slight abnormalities in the brain can prove to be lethal, if not taken care of. Saif just wanna know ..
who are happy all the time ?? your technicality may be good coz i have not studied brain so far but still i feel ki kuch to aisa b hona chahiye aisey ..
Like i read ki some people are more emoional ,some are more ambitious some are more happy .. So the upbringing,the situations and circumstances also responsible for alll this !! 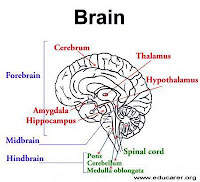 @ "In Search Of ..."
Yes, I have studied about the brain in great detail and that's why I have written this post. Each person has a completely different type of brain. Certain regions (related to emotions)of the brain in some people are developed in such a way that they imbibe more of a positive energy and have a more positive attitude towards life. They are more confident and have more inner strength compared to others. Your question about people who are happy all the time ... do you really think that this can be possible? It cannot be possible for anyone to be happy all the time. As far as other factors being responsible for a person's mood and emotions. I think you haven't read the whole post properly. I have clearly mentioned that although the brain is developed in a certain way, it doesn't mean that the person will be the same throughout his/her life. The upbringing, socialization, and other environmental factors can change the person. Its a combination of biological and environmental factors that makes a person that he/she is. But like I said ... for people whose brain is developed in such a way that they are sad and depressed, it becomes very difficult to be like others. Refer to the post to know the reasons that I gave for this. some people are just miserable all the time...others become miserable whenever they are not happy (like me)...thereare no in betweens! i love the human brain! A definite eye-opener! My heart and prayers go out to these people. Yes, the human brain is very complex and studying about it is really fascinating. I like this post a lot because I myself might be a living example. I suffered from depression a few times when I tried to suppress my sadness and distract myself from my feelings and eventually became numb and depressed. But if I don't suppress my feelings I am just sad a lot. I am extremely sensitive to everything and it's been that way since I was born--according to my mom, before I was even one-month old, I would cry if the person holding me was not my mom. I've been taking psychotherapy for a while but like you said, people like us would need patient family and friends but unfortunately emotional support was never there in my family or from my friends. They all run away whenever I get sad. Oh well, thanks a lot for the scientific clarification. yes, it becomes quite difficult when you don't get the required emotional support from friends and family. I wish that the psychotherapy that you've been taking will prove to be fruitful for you. Also, looking within, being involved in things that you like doing, trying to better yourself, and trying to be happy with oneself makes a lot of difference ... this is something that I have done and believe me it does help a lot. What if you reach the point where you don't even know what you like doing anymore? Like when it feels like everything.you do is automatic be cause it is the expected response from you? How can you find who you are again so that you can rewrite your brain from melancholy to happiness? Advice? I think this is true for me. i have had a privileged life with supportive parents and friends but i can remember having suicide ideation from the age of five and six. Those feelings and thoughts have never gone away and it is very difficult to live with them. Wow! This is great information. I'm disappointed there seems to be limited success for someone like me. I try and try and try but my sad and sensitive feelings have been here my entire life. Too bad science has not figured out a way to fix the messed up brains.